will give your trades POWER! After placing a trade and watching the stock price fluctuate, do you sometimes feel like a tiny boat being tossed around in a stormy ocean or a cruise liner diverted from the storm and cruising in calm waters? that by giving you the ability to trade with more confidence. A trend is the direction that price is moving and will either be an uptrend, a downtrend or a sideways trend. The main point of looking at market trends is to buy into an upward trending market rather than a downward trending market - unless, of course, you are prepared to sell shares short. Either way, checking on the market's direction will give you a better chance at a gain rather than a loss. It’s a little like some turbo boost action on your trade if you're taking a long position and it's risk management when you can read when the market is going against you. 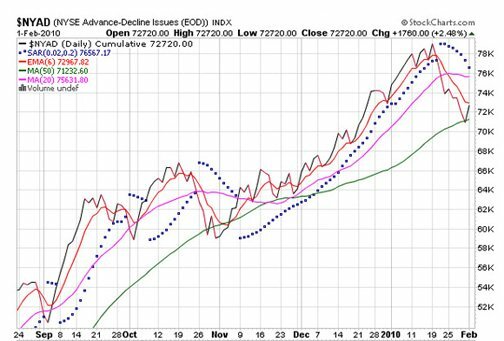 Take a look at the two charts of the $NYSE index charts below and think about which market you would have preferred to be buying or selling into. After looking at those two charts, you can see how important it is to know how to read market direction so you can decide when to get in and out of a position or even when to stay in cash. 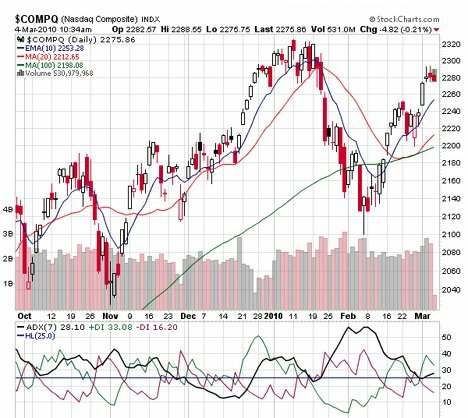 If you’re already in a position, a change of stock market trend can signal you toward the defensive side of trading and act as a warning to protect your gains and your capital by tightening your stops. In the example above, when an indice's price goes below two or more moving averages (blue, red and green lines on the chart) it's a clear signal not to enter long positions. If you do, it's likely you will lose money and that's not what we're here to do. If you're a longer term investor, rather than dollar-cost averaging by buying into stock positions at the same time each month, consider spending a few moments looking at market trend before increasing positions. If the market is trending downward, a strategy to try is to keep the monthly money in cash until the next month while looking for signs of a trend reversal. After a few months, see if timing entries to a trend signal increases overall gains. 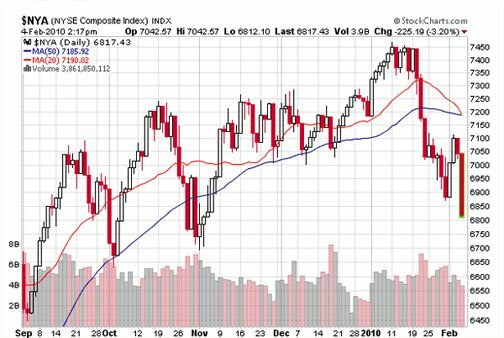 The average directional index (ADX) is the king of trend indicators and can absolutely work to determine trend. 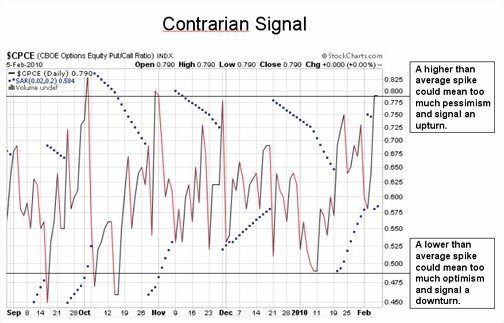 It gives a clear, easy-to-read picture of what is happening with the market by providing a value to trend strength and insight to whether a trend is strengthening or weakening. This is the indicator I personally use to determine whether to enter long or short positions or to stand aside in cash. It also helps me to see if I should tighten my stops when trends begin to weaken. 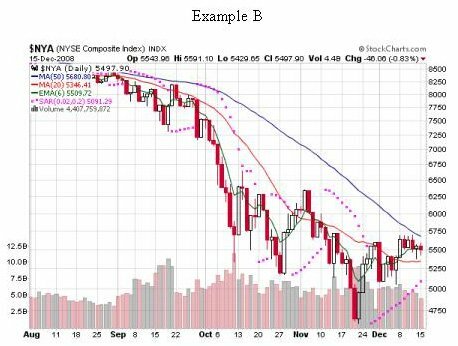 The next two indicators, Moving Averages (MAs) and Parabolic SAR can help with determining trend or confirm a move. Multiple moving average (MA) lines provide directional trending or non-trending lines that indicate trend when the price closes above or below a line or the lines cross. In the chart below the red line (20-day) MA and the blue line (50-day) MA are just about to cross signaling a confirmation of a down trend. The moving average lines can be adjusted to the average length of time you like to hold a position. If you're a long-term investor, the moving average time periods can be 50-day and 200-day. Shorter term can be 10-day and 30-day. It's up to you to determine in your trading plan how you want to adjust your market trend information. Some easy ways to quickly get a sense of market trend is to use the Parabolic SAR which is identified by the blue dots on the chart below. What you want to see is if they are below or above the price bars. If the dot is below the price bar it signals a trend upward. If above, it signals a downward movement. Tip: If you dollar cost average, the Parabolic SAR can be the indicator you look to as a signal to add more to your position or keep the money in cash until you see a positive signal. You can look at a weekly chart with Parabolic SAR too to get a smoother, longer-term view of trend. ACTION STEP: Pick one or two of the above indicators that makes sense to you. Click on any of the headings to understand more about any of these helpful market trend indicators. Begin taking a minute or two looking at an index of your choosing with the indicator(s) on a daily or weekly basis depending on your investing style. After a short while, you will be in tune with the stock market trend. You'll begin to easily see and act on shifts in the markets which will give you more confidence and your trades a higher probability of success. There are a couple of other things you can look at to help determine market direction like overall trader or market sentiment. Market sentiment is sometimes called “crowd psychology” as it relates to fear or complacency. Two indexes that assist with this are the Advance-Decline Issues Index and CBOE Options Equity Put/Call Ratio Index. They simply give you an additional perspectives on what's happening in the markets. Advance-Decline Issues show whether more stocks are actually increasing or decreasing in value which can be helpful in determining the overall mood of the markets. In the example below of the advance/decline trend of $NYAD (NYSE Advance-Decline Issues), you can see where a negative shift began recently. On this chart, you can even apply moving averages or the Parabolic SAR indicator to help clairfy the trend direction. And lastly, a tool for helping gauge the future stock market trend is the $CPCE (CBOE Options Equity Put/Call Ratio). If this sounds intimidating, don't worry, it isn't, but if you find that it is more than you need or want to know that's ok. The other market trend indicators will serve you just fine. Gives you a sense if people are feeling optimistic or pessimistic about the future of stocks based on put/call purchases (example below). Some of these easy to identify stock market trend methods can also be applied to individual stocks to determine their price trends. These aren’t hard and fast signals to live by, but they do offer a legitimate view of what the markets are doing at any given time. We, as Stock Trading Warriors, not market makers, have to follow different rules of engagement. Reading stock market trend is not an exercise in attempting to predict the future, but a response to the markets as they are. Remember, no one can predict the future. 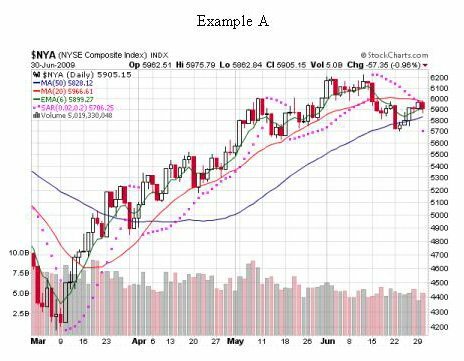 These are terrific ways to determine the general direction of a current stock market trend, and it’s knowledge that will help you to make smarter and better trades. When you have a comfort level with determining the stock market trend you can move on to the next step of finding the best stock to buy. 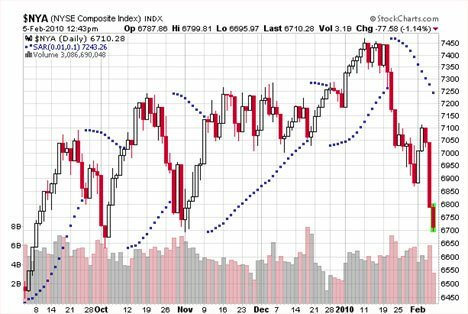 Move on to the next step in determining market trend - by studying the king of trend indicators, Average Directional Index (ADX). Return from Stock Market Trend to Creating Stock Market Systems that work! Return to Online Stock Trading Warrior Home. the Stock Trading Warrior's FREE Daily Stock Market Direction Signal - Updated Daily.